Lawrence Wealth Management is a fee-only investment management firm and does not sell annuities, insurance products or any commission-based financial products. This report is for informational purposes only. Annuities issued by insurance companies are complex contracts that are marketed without disclosing many important details of which investors should be aware before signing the contract and committing funds. As in a "Tom Waits” song… “the big print giveth; and the small print taketh away”. An insurance annuity is a contract between an insurance company and an individual with certain contractual obligations (guarantees) provided by the insurance company. The funds invested in these contracts convert fully liquid funds into tax deferred funds that would be subject to a 10% penalty and taxes if withdrawn prior to age 59 ½ and, in many cases, could be subject to surrender charges of 10%, with that percentage declining over a 7 - 10 year period. Annuity tax implications can be very damaging! All annuity investment gains are tax differed until withdrawn, at which time all gains are taxed at ordinary tax rates, and not capital gains rates. This tax treatment could increase the investment gain tax rate from 23.8% to 43.4%! In contrast, investment gains in a taxable account are subject to a 23.8% (highest rate) capital gains rate if the investments are held for a year or more. An annuity’s cost basis is not “stepped up” at death. In a taxable investment account, the decedent’s investments’ cost basis is stepped up at death. When the asset is passed to the heir, the cost basis increases to the investment value at time of death. This favorable treatment is lost with an annuity and the heir will pay up to 43.4% tax on any gain remaining in the annuity if sold! A fixed annuity grows at a fixed rate based on interest rates and typically has a guaranteed “floor” rate that is applied each year. The underlying costs are low and the tax treatment is favorable when compared to bonds in a taxable account. Both bond interest income and fixed annuity gains are taxed at ordinary tax rates. The tax benefit is tax deferral. Sales commissions and underlying expenses are low. Depending upon interest rates and an investor’s bond allocation, fixed annuities could be very attractive at particular times in the interest rate cycle. Fixed annuities typically have surrender charges from 3-9 years. The reason for these surrender charges is that the insurance company buys bonds that mature in three years for the three year annuity; five years for the five year annuity, etc. Once the initial holding period passes, the contract value is fully liquid, except for the 10% IRS penalty if funds are withdrawn prior to 59 ½ years of age. With an immediate annuity, investors invest a lump sum of funds with an insurance company which in turn pays the investor a set amount of money each month for life. The investor has no access to the funds after investing in an immediate annuity. One’s pension from an employer is an immediate annuity. The main benefit of an immediate annuity is that the monthly payments continue until death. Internal costs are low and internal rates of return at the current time are in the low single digits. Sales commissions and underlying expenses are low. Immediate annuities can be attractive, especially when used to pay a fixed expense. Caution! A variable annuity is an investment product with insurance features. It allows you to select from a menu of investment choices, typically mutual funds, within the variable annuity and, at a later date—such as retirement—allows you to receive a stream of payments over time. The value of your variable annuity will depend on how your investment choices perform. The insurance markets a “guarantee”; however, the value of your investments is not guaranteed at all. When/if the investor chooses to receive a stream of payments, these payments become guaranteed at that time. If you are 65 years of age, the insurance company may offer a 5% income stream for life. The insurance company is not guaranteeing the value of your investment accounts! Life expectancy at 65 years of age is 83 years of age for a man and 85 years of age for a woman. So, a 5% income return fully returns your funds to you in 20 years (100 divided by 5% = 20 years). The benefit is if you live beyond your life expectancy, the income stream continues through the end of life. One could achieve an income for life with an immediate annuity with lower fees and better financial results. Sales commissions and fees are high! Sales commission are 6-8% and underlying expenses, which are not easily determined, are 3.0-3.5% of assets annually. WE DO NOT RECOMMEND VARIABLE ANNUITIES. These are heavily marketed as they are highly profitable products for the insurance companies and salesperson. We recommend that investors avoid these annuities at the current time. 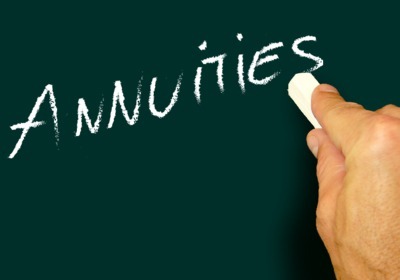 In summary, annuities are sold by contracts that are detailed and complex. These contracts, and not the marketing materials or “illustrations”, should be read and understood before committing any funds. These are long term contracts and are very expensive to exit, if an exit is even an option. If you would like additional information about annuities, financial planning, or investment management advice on a fee-only basis, contact me Richard Lawrence at Lawrence Wealth Management LLC., a private investment firm in West Conshohocken, PA . Phone 215-540-0896; email rich@lawrencewealthmanagement.com.